Bring one pint of water, brown sugar, salt, chili powder, garlic powder, cayenne sauce, and rice wine vinegar to a boil. Then reduce heat and simmer for about 5 minutes. Add the mixture to a large pot, then add 3 pints of ice water to cool the brine quickly. Add the wings to the cool brine. Allow the wings to sit in the brine for 2 to 6 hours. Once brined, remove the wings and pat dry with paper towels. Add them to a bowl with a tiny bit of olive oil. This will keep the wings from sticking to your grill. Turn on your on medium to medium-high heat, and spray with non-stick spray. Keep an eye on the wings to avoid any flare-ups on your grill. Grill for about 15 minutes, or until the wings are done. Combine the melted butter and hot sauce in a large bowl. Mix well to combine. 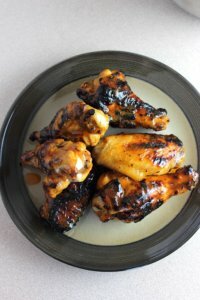 Remove your wings from the grill and add them to the sauce. Toss to coat well.